Mount Kilimanjaro has three volcanic cones but now a dormant volcano in Tanzania and part of the Kilimanjaro National Park. 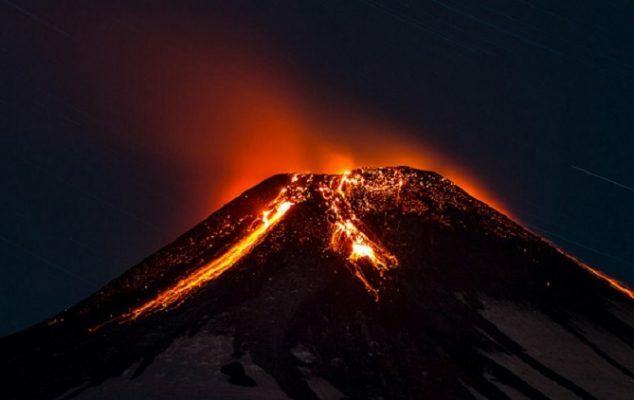 Here is the list of top 30 world’s more fearsome active volcanoes along with last eruption. Kilauea shield volcano of Hawaiian Islands is one of the five volcanoes in the Hawaiian Islands and most active among the others along with Mauna Loa. Mauna Loa Volcano is largest volcano on Earth and an active shield volcano in Hawaiian Islands. The volcano is now part of Hawaii Volcanoes National Park, No recent eruptions since April 1984. Erta Ale Volcano in the Afar Region of Ethiopia is a continuously active volcano in the world. The last eruption was reported in January 2017. Villarrica Volcano is the most active volcanoes in Chile and the last eruption occurred on February 2015. Stromboli Volcano is the most active volcanoes in Italy and the Stromboli mountain contains three active volcanoes in Italy, Mount Vesuvius and Mount Etna. Mount Etna is another most active volcanoes in the world, located on the east coast of Sicily. Mount Agung volcano in Bali of Indonesia is one of the recently erupted volcano and erupted five times in the lats year of November 2017 and erupted once again on January 11 2018. 1963 eruption of Mount Agung was the most devastating volcano eruption in Indonesia with volcanic earthquakes. Mount Slamet Volcano is another active stratovolcano in Central Java province of Indonesia, erupted in 2009 and again in September 2014. Mount Semeru is the highest mountain of Java and an active volcano in Indonesia, the mountain is a favourite mountain trekking destination. Mount Merapi is an active stratovolcano and the most active volcano in Indonesia. The Mount Merapi was last erupted in year 2010. Mount Erebus volcano is an active and currently the most active volcano in Antarctica. Ross Island of Antarctica is also home to three inactive volcanoes. Piton de la Fournaise shield volcano in the Indian Ocean is another most active volcanoes of the world and erupted again in July 2017, also a major tourist attraction on Reunion island. Eyjafjallajokull Island Mountain Glacier Volcano has recently erupted in 2010. Southern Iceland also has one of the large volcano, named Katla volcano. Grimsvotn volcano was recently erupted in 2011 and has highest eruption frequency of all the other volcanoes in Iceland. Sakurajima Volcano is an active volcano located in the Aira caldera. The peak is now part of the Kirishima Yaku National Park and the lava are major tourist attraction in Japan. arren Island Volcano in the Andaman Sea of India is the only active volcano in India and one of the active volcano in South Asia. The volcanic island has shown intermittent activity on January 23 2017. Galeras Volcano is currently the most active volcano in Colombia along with Nevado del Ruiz. The volcano erupted on January 2010 and again on August 2010. Volcan de Colima is the most active volcanos in Mexico and designated a Decade Volcano. The volcano erupted on November 2014 and another eruption was on July 2015 and then again with explosion on January 2017. Popocatepetl is another most active volcano in Mexico, last eruption on January 2004. Mayon Volcano on the large island of Luzon is active stratovolcano, located inside Mayon Volcano Natural Park and a phreatic eruption was reported on January 2018. Taal Volcano is the second most active volcano in the Philippines with several violent eruptions over the last five years. Ulawun Volcano is the most active volcanoes in Papua New Guinea and most dangerous too, as ten thousand people live near the volcano. Nyamuragira active volcano is another active Volcano in Virunga Mountains and Africa’s most active volcano. 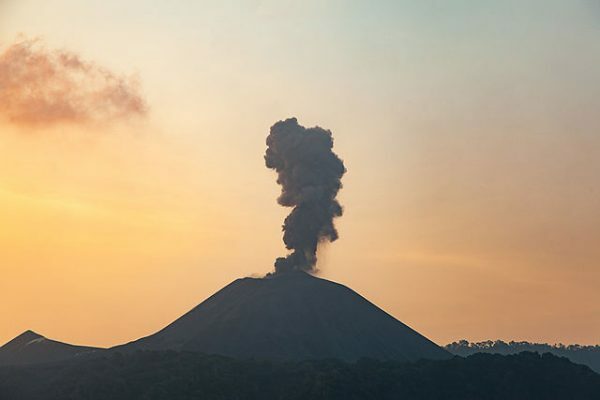 Mount Nyiragongo is another volcano located inside Virunga National Park and an active stratovolcano with ongoing threats of carbon dioxide toxicity. Santiaguito Volcano in Santa Maria of Guatemala was erupted in 2016 and has been designated a Decade Volcano. Pacaya is a popular tourist attraction and an active complex volcano in Guatemala, volcano erupted on May 2010. 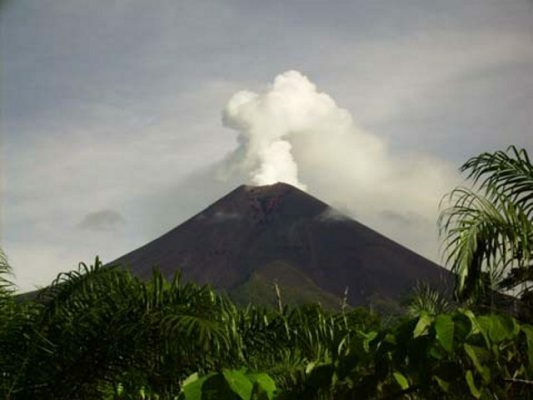 Arenal Volcano of Costa Rica is considered a young volcano and the last eruption was occurred in 2006. Mount Cleveland of Alaska is one of the most active volcanoes in the region, last erupted in 2008. Mount Yasur volcano is a major Vanuatu tourist attraction in Vanuatu and an easily accessible active volcano in the world. Mount Batur is another most active volcano in Indonesia, located near the Mount Agung on the island of Bali. Mount Vesuvius is the most dangerous volcanoes in the world and have erupted many times within the last hundred years. Mount St. Helens is an active stratovolcano, well known for its ash explosions. The peak of Mount St. Helens is now a popular hiking mountaineering destination.